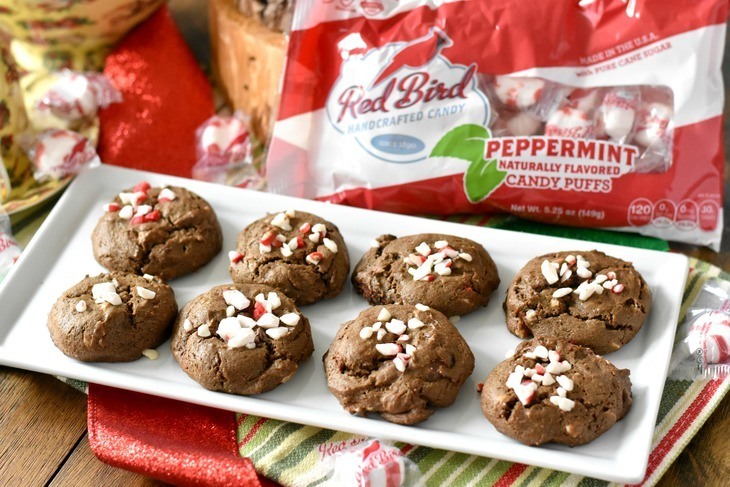 This Chocolate Chip Peppermint Cookies recipe is sponsored by Red Bird Candy. All opinions are my own and I believe in sharing all of the gluten free goodness and brands I love with you. Thank you Red Bird Candy! I have been eating Red Bird Candy since I was a child. 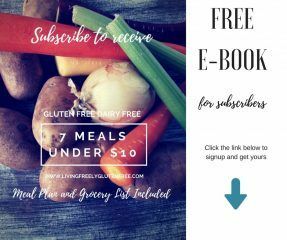 When we went gluten free I began looking for a trusted candy brand that I could share with my kids and I received some Red Bird candy in my Love With Food Box. I was overjoyed to find out that I could still have one of my favorites and share them with my kids. Last year I reached out to Red Bird and we collaborated and created a Chocolate Cupcake with Peppermint Buttercream Frosting. Sooo good. If you need a cake recipe please go check it out. This time around I knew gluten free cookies were the way to go because gluten free dairy free Christmas cookies are always a hit this time of year with cookie exchanges, parties, and gift giving. They are easy to make, taste amazing, and gift beautifully. 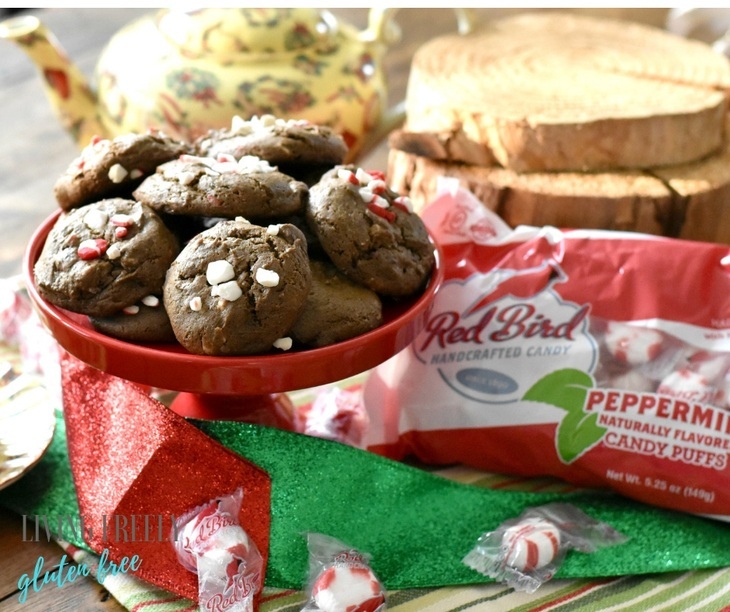 I knew right away that chocolate chip peppermint cookies would be a huge hit and using Red Bird crushed peppermint candies would be the perfect combination with the chocolate chips. Peppermint and chocolate go so well with each other. 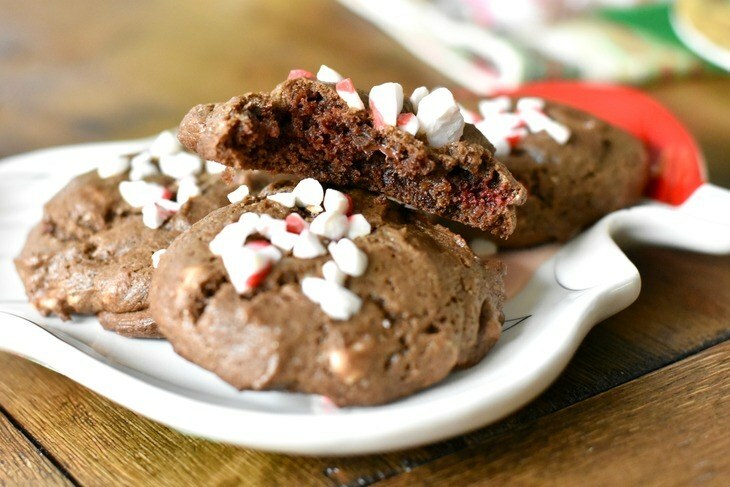 My favorite way to enjoy these chocolate chip peppermint cookies is with a cup of my Vegan Hot Chocolate. This has become a family tradition while decorating our tree. These gluten free dairy free Christmas cookies are very easy to make and the ingredients are easy to find as well. If you are not dairy free you can use regular butter in place of the vegan butter with the same measurements. 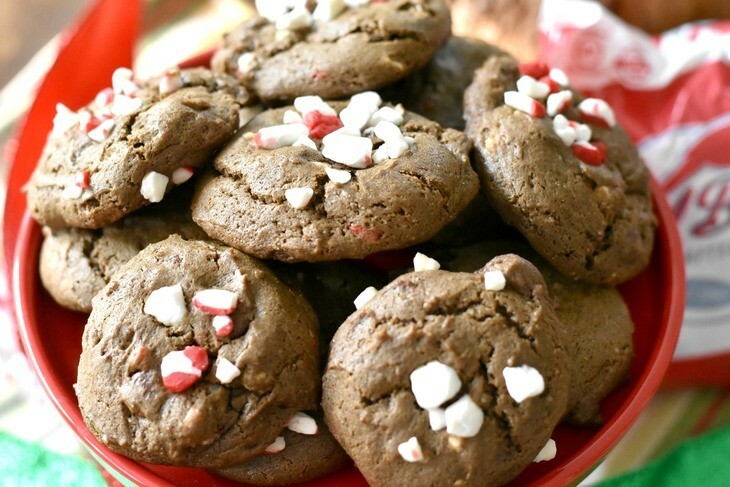 One of my favorite part of these chocolate chip peppermint cookies is the texture. They are light and fluffy with a hint of chewy- perfection for gluten free cookies! 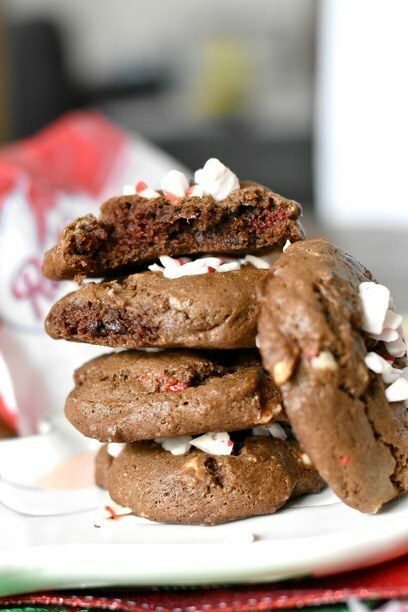 How do I make these Chocolate Chip Peppermint Cookies? You will start by mixing the butter with the brown sugar and granulated sugar- You will need a mixer for this (a stand mixer works best). Add the vanilla and eggs. Mix until the butter fluffs up nicely. Add the cocoa powder and peppermint extract. Mix for an additional minute. Add the Gluten Free All Purpose Flour, baking soda, baking powder, xanthan gum, and salt. Mix for 3 minutes scraping the sides of the bowl halfway through. Add the chocolate chips and crushed Red Bird peppermint candies. Mix for about 15-20 seconds, just until the chocolate and candy are blended through the mixture. Line a baking sheet with parchment paper and use a cookie scooper to drop the dough onto the parchment paper (for a fluffier cookie, refrigerate the dough between 20 and 30 minutes prior to scooping). Bake for 14 minutes, remove from oven, and allow to cool on a cooling rack for about 20 minutes before serving. This yields 3 dozen cookies (you can also freeze the dough for later use). Pro-Tip- Not all Gluten Free Flour is created equal. I only use My Gluten Free All Purpose Flour Blend and I love the results, please give it a try. Q: If my gluten free flour has xanthan gum do I need to add it again? A: No, if your flour contains it do not add more. How do I freeze the Chocolate Chip Peppermint Cookie dough? It is so darn easy! You will drop the gluten free cookie dough onto parchment paper, put the parchment paper in a freezer bag, and put it in the freezer. When you are ready to make them, remove them from the freezer bag (no need to thaw) and just put them on a baking sheet lined with new parchment paper. Bake at 350ºF for 17 minutes. That’s it! 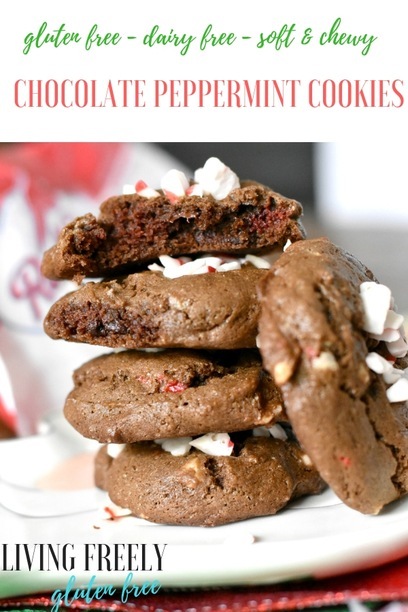 So, now that it is the time of the year for baking Gluten Free Dairy Free Christmas Cookies make sure you give these Chocolate Chip Peppermint Cookies a try! Santa loves them too! Enjoy and Happy Holidays. These soft and chewy cookies are the perfect gluten free dairy free Christmas cookies. Then you will add the cocoa powder and peppermint extract. Mix for an additional minute. Line a baking sheet with parchment paper and use a cookie scooper to drop the dough onto the parchment paper (for a fluffier cookie refrigerate the dough between 20 and 30 minutes prior to scooping). Bake for 14 minutes, remove from oven, and allow to cool on a cooling rack for about 20 minutes before serving. This yields 3 dozen cookies (you can also freeze the dough for later use). These looks so Christmas-y! My family loves everything peppermint. Thanks Heather! I love Peppermint too! This recipe looks so good!! I’ll have to make it and homemade ice cream (with red bird mints in it) so I can have the best ice cream sandwiches!!!! That is such a good idea! I’m going to have a candy cane vegan ice cream recipe up at the end of next week that will be perfect!